On Cue Studio is pleased to announce that Jose’ Acosta, an Emmy award winner and seasoned producer, director, DP, editor, animator and visual effects artist has been selected to be the Director of two of On Cue Studio’s most recent acquisitions. We are confident in the ability of Jose’ to create On Cue Studios vision for these projects. The son of Cuban immigrants, Jose’ grew up in Washington, DC, doodling his way through school. He saw Star Wars when he was 12 and was inspired to tell stories with moving pictures, both animated and live action. Jose’ studied English literature at the University of Maryland, with special attention to Shakespeare, Mary Shelley, and Poe, as well as creative writing. 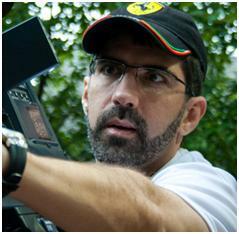 Jose’ received his Master’s degree in Film and TV from Georgia State University in 1991. He won a regional EMMY for his animation on a PBS kid’s show in 1998, and was nominated several more times. After serving as Art Director at the Home Depot headquarters, and Director of Broadcast Design at ad agency Studiocom, Jose’ began directing commercials with his production company, DoubleRaven Studios. He has served as producer, director, DP, editor, animator, and/or visual effects artist on a wide variety of projects for some of the world’s best-known brands like Aflac, Cartoon Network, Coca-Cola, Crayola, Disney, Dunkin Donuts, Ferrari, The Home Depot, NASA, Nerf, PBS, Porsche, The Weather Channel, and many others. Today, Jose’ is back to the entertainment industry where he started. He designed visual effects for a Cartoon Network show, and shot an independent feature in 2011. He completed his TV directorial debut, a one hour historical drama (Poe’s Mystery Theatre) in 2014. Jose’ resides in Marietta GA with his wife and three children.